In this Android tutorial, I will walk you through how to find the address based on the mobile location. We have got GPS or network provider in the Android device and we can use that to get the current location in terms of latitude and longitude. Using the latitude and longitude we can get the address by Google Geocoding API. Geocoding is the process of converting the addresses (postal address) into geo coordinates as latitude and longitude. Reverse geocoding is converting a geo coordinate latitude and longitude to an address. In this tutorial we will be doing reverse geo coding and get the addresses of the passed coordinates. We need location access permission to find the latitude and longitude of the Android device. Following two lines are the key to give permission to access the location. Following class is the key element in accessing the latitude and longitude of the Android device. It implements the LocationListener and gets the location coordinate updates. We have designed our requirement not to be a continous update for location. On demand we will get the location coordinates. Following class is the key element for reverse geocoding to get the address for the passed latitude and longitude coordinates. We access the Geocoder Google API for reverse geocoding and get every line of address like street, city, pin / zip code and etc. How these pieces fit together is with the following Android activity. Need Google API access and so remember to run in an emulator that is configured for Google API. 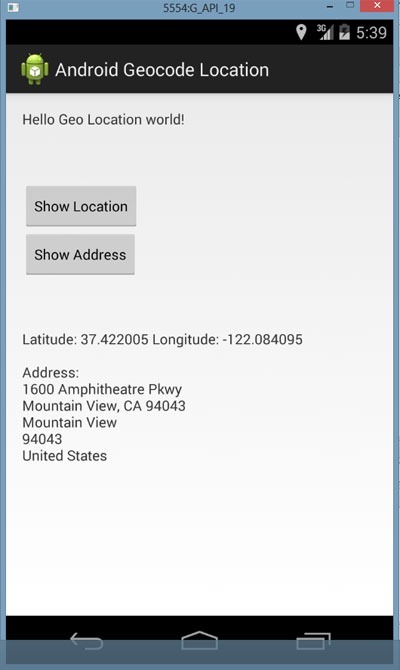 To test via an Android Emulator, we can use the DDMS and pass the latitude and longitude using the ‘Emulator Control’. Comments on "Android Get Address with Street Name, City for Location with Geocoding"
in layout xml, put OnClick property in atlest one post. so that people can get another way also if they might like. it does not show city name why? i am getting settings Dialogs while my Location Provided is already Enabled. I am also getting same issue as it is opening settings and even enabled the GPS i am not getting the location. Can anyone help to solve this issue. My friend’s device can get the address, but mine can’t. Is it the API level of the device problem? Cause my friend’s device API level is 19, but mine is API 18. Can someone help me? i am too getting the same problem what they mentioned above as open setting even it is ON. I am getting the same issue as the dialogue box keep prompting although I have already switched on the GPS and Wi-fi on my mobile. Any ideas? For those, who are not getting lattitude, longitude values and address too, try using NETWORK_PROVIDER instead of GPS_PROVIDER in your codings. Comment the else part in codings that call the settings. Turn Wi-Fi on in your mobile and try, it will work. I did so and it worked. Thank you! Why u are extending service? You did not start service at all in above program. WTF it only keep asking to enable location provider and never show location.. It doesn’t work. it asks me to enable location provider.please fix it. In addition to changing your settings in emulator, go to DDMS and set latitude and longitude in emulator control and click on send. This code works then. It worked like a miracle. I just followed your steps. But It is taking little bit of time (2sec, In my case) to get address. Is it the normal latency or it its happening in my case? Please provide if there is any faster way / new alternative. for all whose getting a Setting Dialog when using this code, why don’t you try using LocationManager.Network_Provider? in this code, the MainActivity is using GPS_Provider. can we find the longitude and latitude of a current location with no internet connectivity.?? if yes,can you provide me the code. Comments are closed for "Android Get Address with Street Name, City for Location with Geocoding".